Jorge Ubico y Castañeda (November 10, 1878 - June 14, 1946) was President of Guatemala from February 14, 1931 to July 4, 1944. Ubico is widely considered the last of the liberal authoritarian rulers in Latin America. A Colonel by the age of 28, Ubico was a military governor by the age of 29. In 1920, he became Chief of Army Staff. Between 1921 and 1923, he was minister of war under General José M. Orellana, having helped install him as President, also serving as ambassador to the U.S. He ran for the Presidency in 1922 and in 1926, then won the 1930 election, a result that was allegedly engineered with U.S. assistance. In office, he shed his democratic pretensions and began 13 years of autocratic, dictatorial rule. Throughout his presidency, he held firm control over his country. More than once, he extended his term, and was quick to employ censorship and the police in order to implement his policies. He initiated several domestic programs for his country, but offered only minimal financial support to see to their completion. He was a cold and often paranoid leader who was known to be quite testy and easily angered. Ubico felt that communism was immoral and criminal. He would attempt to install a close friend in his post when he was forced to resign, but the regime replacing him was short-lived in the end. As part of development and government reorganization, he installed "Ubiquistas" into key governmental positions. He focused on stimulating coffee exports and improved prices and also built an extensive network of roads and modernized local administrations, including health and school facilities. Among other positive social reforms he abolished debt slavery and peonage. Yet, he ruled as a tyrant, harshly suppressing opposition through press censorship and police control. He was forced to resign by a national strike in 1944, installing a General as his successor who himself fell to a military coup after three months. Authoritarian regimes at this time justified their rule by claiming that strong leadership was needed to combat the threat of communism. Two wrongs, however, do not make a right. Those who champion freedom, democracy, and justice for all need to live up to their ideals, not mimic the tactics of those they oppose while pretending to be fighting tyranny and oppression. Unethical means to not justify the end. Born to Arturo Ubico Urruela, a lawyer and politician of the Guatemalan liberal party who was also a wealthy landowner. President Justo Rufino Barrios was Ubico's godfather. Jorge Ubico was sheltered for most of his childhood. He was privately tutored and attended school in Guatemala's most prestigious institutions as well as receiving further education abroad in the United States and Europe. By 1897, Ubico received his commission into the Guatemalan army as second lieutenant, which was largely a reflection of his political ties, since he had failed to graduate from the military academy. In 1906, he took part in the a border war with El Salvadore. He rose rapidly through the ranks. He was one of the first Guatemalans to receive military training in the U.S. By the age of 28, he had the rank of colonel. A year later, he was made military governor (jefe politico) of the province of Alta Verapaz (1907-09), followed four years later as governor of Retalhuleu (1911-1919). During his tenure, he oversaw improvements in public works, the school system, public health, and youth organizations. In 1918, he drained swamps, ordered fumigation and distributed free medicine to combat a yellow fever epidemic, and won the praise of Major General William C. Gorgas, who had done the same in Panama. It was as head of the National Sanitary Commission in the fight against yellow fever that he established a reputation as an efficient administrator. However, his reputation also came from his harsh but effective punishment of banditry and smuggling across the Mexican border. 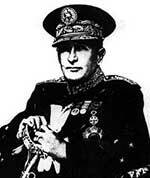 He returned to Guatemala City in 1921, to participate in a coup that installed General José Orellana into presidency. Under Orellana, he reached the rank of Secretary of War in 1922, and also served as an ambassador to the U.S. In 1926, after the death of President Orellana, Ubico ran unsuccessfully for president as the candidate of the Political Progressive Party. He temporarily retired to his farm until the next election. In 1930, President Lazaro Chacon resigned after having a stroke. By that time, Guatemala was in the midst of the Great Depression and bankrupt. The Liberal Party joined with the Progressives to nominate Ubico as the successor, and although he was the only candidate on the ballot, he received 305,841 votes. In his inaugural address, he pledged a "march toward civilization." Once in office, he began a campaign of efficiency that included assuming dictatorial power. U.S. intelligence had allegedly assisted him in engineering his electoral victory. The U.S. was concerned about the unstable political situation in Guatemala, which invited communist intervention. LaFeber says that the U.S. "set up an acting President to supervise a new election," which Ubico won. They knew Ubico and thought he would restore stability. The intelligence agency enjoyed a close relationship with Ubico while he was in power, helping him crush opposition. He was a charismatic individual who was not unpopular with his own people, although he had failed so far to win the Presidency. Throughout his period in office, he maintained his links with the U.S. Before World War II, he agreed to deport German plantation owners as the request of the U.S. He did so with some reluctance, since he admired Adolf Hitler. 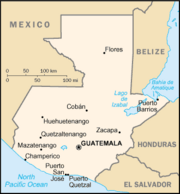 In 1941, however, Guatemala was the first South American country to follow the U.S. and declare war on Germany. In 1936, a new contract with United Fruit was negotiated personally between Ubico and officers of the Central Intelligence Group (the predecessor of the CIA, which was not formed until 1947). The Company controlled over 40 percent of the most productive land, and the country's only sea-port. Ubico admired Napoleon Bonaparte and preferred to have his photograph taken in his general's uniform. Although he was much taller than his hero, Ubico believed that he resembled Bonaparte, and his nickname was "the Little Napoleon of the Tropics." He preferred traveling by motorcycle on his frequent inspection tours of Guatemala's twenty-two departamentos. He thought of himself as a reincarnation of the French Emperor. As part of development and government reorganization, he installed "Ubiquistas" into key governmental positions. Ubico focused on stimulating coffee exports and improved prices. He built an extensive network of roads and modernized local administrations, including health and school facilities. Ubico also abolished debt slavery and peonage, and oversaw the Vagrancy law which issued identification cards to all Guatemalans for the purpose of enforcing employment. Instability ended, but the price was high. His methods were authoritarian. Ubico harshly suppressed opposition through press censorship and police control. He also engineered constitutional changes twice to extend his term as president. He abolished municipal government and centralized power in his own hands. While his main focus was economic development, it only benefited the upper and land owning classes creating criticism from the middle class. He also stressed the importance of the military through the "educative mission of the barracks." Ubico was a cold individual who preferred to be isolated with only a small circle of companions. His legendary temper created fear as he dealt with others in a sort of verbal fencing match rather than conversations. His suspicious nature made him addicted to work, as he always had to be doing something. He was also a notorious penny-pincher, seeking the least expensive means to complete tasks. Ubico was also an opponent of communism, equating it with criminality and political opposition. He established a spy-network which he used to root out opposition, especially before an election. He denounced anyone whose views were more "progressive than his" as a communist. His police chief would later proscribe the books of Victor Hugo and Fyodor Dostoevsky as subversive. Tomás Borge described Ubico as "crazier than a half dozen opium smoking frogs." Ubico reportedly dressed his soldiers in eighteenth century French Army uniforms. On his birthday, he would hang a large star in his palace. The star contained the number 5 on it because his first and last names each had 5 letters. He also professed a concern for the Indian populace in Guatemala, extending facilities to improve their lifestyle. Under his regime the Guatemalan Indian underwent a legal revolution as they were free to move and seek employment. However, this freedom was an illusion as the improvements involved Paternalism and extension of government control. In a sense, he merely transferred their dependency from landowners to the national government. Adopting a pro-American stance to promote economic development and recovery from depression, under Ubico the United Fruit Company became the most important company in Guatemala. He considered Guatemala to be the United States' closest ally in the Caribbean. The company received import duty and real estate tax exemptions from the government, and controlled more land than any other individual or group, along with the sole railroad, the electricity producing capabilities, and the port facilities at Puerto Barrios on the Atlantic coast. By 1940, 90 percent of all export went to the U.S. While the regime passed through stages by 1939, it had outlived its time and from 1939-1944, was clearly in decline. The administration hung on to the early accomplishments for too long and failed to create new policies, effectively losing momentum. The main reason for its downfall was continuismo as the population realized he would never voluntarily leave power. In its later years paranoia hit the president hard, creating fear for his security. Ubico was forced to resign by a general strike against him that started in June of 1944. He installed his friend, General Juan Federico Ponce as his successor. The Ponce regime lasted for only three months, when a military coup overthrew the regime. Ubico fled to New Orleans, where he lived until his death on June 14, 1946. As president of Guatemala from 1931 to 1944, Ubico served as Latin America's final Liberal authoritarian ruler. "The Little Napoleon of the Tropics" idolized the real Napoleon and felt that he resembled his icon. As president, he improved the infrastructure of his country, fixing up and expanding roadways and providing more schools and health facilities for his people. He saw to the implementation of statewide ID cards in order to regulate Guatemalan employment and eradicated debt peonage. Ubico also focused on revamping the military. He was a cruel dictator with an explosive temper. He trusted only a select few, with whom he consulted privately. He was quick to employ censorship and police brutality to enforce his will and was often paranoid. Ubico guarded the funds that he had amassed and attempted to spend as little as possible to implement the improvements he initiated. He claimed to care about the indigenous population, providing them with more resources and the ability to move about freely in search of employment, but in reality they remained under firm control, not indebted to individual patron like before but instead to the government machine. Ubico allied himself with the U.S. and threw in a great deal of support for the United Fruit Company. He was forced to resign after a general strike. He was not the last tyrannical President that the US would prop-up or support as part of the anti-communist program. In 1954, the U.S. bought Colonel Carlos Castillo Armas to power, replacing a regime they saw as too liberal (it legalized the communist party). President Armas employed Ubico's former police chief. To some extent, U.S. support for Ubico's regime was a testing ground for the development of covert strategy. "By 1939," says LaFeber, "no where had the U.S. system better proved its effectiveness than in Guatemala," since through United Fruit that more or less ran the country, diverting exports (coffee) from Germany to the U.S.—bananas, not coffee. Not surprisingly, they viewed the protests against him in 1944 with alarm. Those who led the struggle of the free against the communist system which, in their view, was oppressive and totalitarian, too often compromised their own principles in pursuing their agenda. Support for Ubico and for the dictators who succeeded him stains the record of those who champion, democracy, social justice, human rights, and freedom of every type. ↑ Maxine Block and E. Mary Trow, Current Biography: Who's News and Why 1941 (New York: H.W. Wilson Co., 1941). ↑ Ralph Lee Woodward, Guatemala, Encarta Online Encyclopedia. Retrieved August 21, 2008. ↑ 4.0 4.1 Kinzer (2006), 130. ↑ 6.0 6.1 Kinzer (2006), 203. ↑ The Rough Ride Guide to Guatamala, Jorge Ubico and the banana empire. Retrieved August 21, 2008. ↑ Hook and Spanier (2000), 101. Borge, Thomas. 1992. The Patient Impatience. Willimantic, CT: Curbstone Press. ISBN 9780915306978. Grieb, Kenneth J. 1979. Guatemalan Caudillo, the regime of Jorge Ubico: Guatemala, 1931-1944. Athens, OH: Ohio University Press. ISBN 9780821403792. Hook, Steven W., and John W. Spanier. 2000. American Foreign Policy Since World War II. Washington, DC: CQ Press. ISBN 9781568025780. Kinzer, Stephen. 2006. Overthrow: America's Century of Regime Change from Hawaii to Iraq. New York: Times Books/Henry Holt. ISBN 9780805078619. LaFeber, Walter. 1983. Inevitable Revolutions: The United States in Central America. New York: Norton. ISBN 9780393017878. This page was last modified on 17 September 2008, at 15:39.